The American dipper (Cinclus mexicanus), also known as a water ouzel, is a stocky dark grey bird with a head sometimes tinged with brown, and white feathers on the eyelids that cause the eyes to flash white as the bird blinks. It is 16.5 cm (6.5 in) long and weighs on average 46 g (1.6 oz). It has long legs, and bobs its whole body up and down during pauses as it feeds on the bottom of fast-moving, rocky streams. It inhabits the mountainous regions of Central America and western North America from Panama to Alaska. 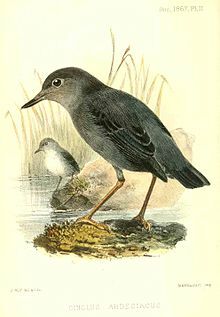 The American dipper was described by the English zoologist William John Swainson in 1827 and given the binomial name Cinclus mexicanus. The type locality is Temascaltepec de González in Mexico. This species, like other dippers, is equipped with an extra eyelid called a "nictitating membrane" that allows it to see underwater, and scales that close its nostrils when submerged. Dippers also produce more oil than most birds, which may help keep them warmer when seeking food underwater. The song consists of high whistles or trills peee peee pijur pijur repeated a few times. Both sexes of this bird sing year round. The American dipper is usually a permanent resident, moving slightly south or to lower elevations if necessary to find food or unfrozen water. The presence of this indicator species shows good water quality; it has vanished from some locations due to pollution or increased silt load in streams. The American dipper defends a linear territory along streams. In most of its habits, it closely resembles its European counterpart, the white-throated dipper, Cinclus cinclus, which is also sometimes known as a Water Ouzel. 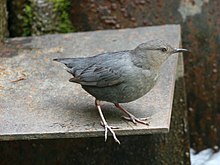 The American dipper's nest is a globe-shaped structure with a side entrance, close to water, on a rock ledge, river bank, behind a waterfall or under a bridge. The normal clutch is 2-4 white eggs, incubated solely by the female, which hatch after about 15–17 days, with another 20–25 days to fledging. The male helps to feed the young. The maximum recorded age from ring-recovery data of an American dipper is 8 years and 1 month for a bird ringed and recovered in South Dakota. It feeds on aquatic insects and their larvae, including dragonfly nymphs, small crayfish, and caddisfly larvae. It may also take tiny fish or tadpoles. Its habit of diving underwater in search of food can infrequently make it the prey of large salmonids like bull or Dolly Varden trout. ^ BirdLife International (2012). "Cinclus mexicanus". IUCN Red List of Threatened Species. Version 2013.2. International Union for Conservation of Nature. Retrieved 26 November 2013. ^ Swainson, William John (1827). "A synopsis of birds discovered in Mexico by W. Bullock F.L.S. and H.S. and Mr. William Bullock, jun". Philosophical Magazine. New series. 1: 364-370 . ^ Mayr, Ernst; Greenway, James C. Jr, eds. (1960). Check-list of Birds of the World. Volume 9. Cambridge, Massachusetts: Museum of Comparative Zoology. p. 378. ^ Elliott, Charles L.; Peck, Steve (December 1980). "Dipper swallowed by trout" (PDF). Wilson Bulletin. 92 (4): 524. Wikimedia Commons has media related to Cinclus mexicanus. 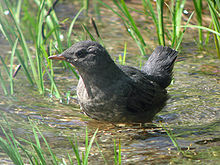 Short radio episode The Water-Ouzel, from The Mountains of California, by John Muir 1894. California Legacy Project. This page was last edited on 13 February 2019, at 16:28 (UTC).